Coming Up: On the road with Ken Latham.
" 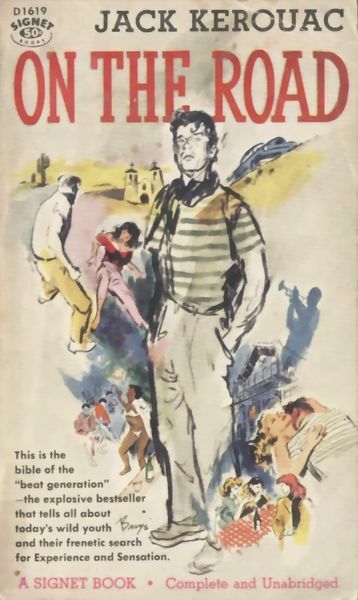 It all began for me when I started to climb on a regular basis and having to exist on a meagre wage meant no car- also I had just read On the Road by Kerouac, so I can blame him a little for all the angst. The journey would invariably start with a train or ferry trip as hitching across the Mersey was a nightmare. Once the divide had been crossed then the serious stuff would begin in earnest and there were ethics to adhere to- I kid you not. It was all important to walk the short distance from the ferry terminal or the underground at Birkenhead to the Welsh road, the open highway and direct link to the hills(if you were lucky). Unfortunately this meant that you had to pass the horrendous stench of the leather tanning works which would turn an extreme leader’s stomach to jelly in one small swift nostril full......it will remain in the memory as one of those reminiscent aromas of ones life forever like sherbet dips or pear drops... but it was a small price to pay for the trip ahead. There would invariably be one or two other guys in line for a lift and we would take it in turns when offered a seat. It was all very courteous and you would often meet the same crew from week to week. This Friday...Ken Latham recalls the romance and misery of hitchhiking. Aleister Crowley....mountains and other goats. With this in mind, it must have been disconcerting to say the least, to find yourself at 22.000 ft on K2 and staring into the barrel of Crowley's revolver! This surreal experience was the fate of Guy Knowles, a 22 year old Cambridge undergraduate who with Crowley had been a member of the first ever expedition to attempt to summit K2 in 1902. Knowles' crime had been to challenge Crowley on aspects of his leadership. A role which history suggests Crowley was manifestly unsuited. Crowley may have been passionate in his interests, however, amongst those passions was a zealous desire to climb mountains. Largely forgotten amongst the satanic hyperbole is the plain fact that Aleister Crowley was an outstanding mountaineer in his day whose achievements include the first ever attempts to scale K2 and Kanchenjunga in 1902 and 1905 respectively. However his skills as a mountaineer and his self promoted leadership skills appear to have been-as we shall see- poles apart. As a young man Crowley had made some climbs at Beachy Head of which he had corresponded with legendary Alpinist A F Mummery. Furthermore, he had climbed extensively in Britain and the Alps and became a regular habitue of Wasdale Head and respected member of its attendent climbing fraternity. Climbing with such legendary figures as J W Robinson; Norman Collie; Geoffrey Hastings and 0 G Jones. 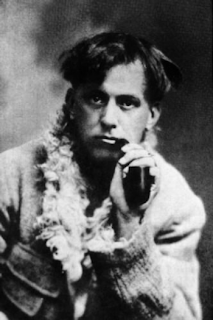 Not surprisingly Crowley took delight in playing the maverick role to the full and poking fun at the climbing establishment.However his skills on the rock were recognized by his peers even if they chose not to pursue a social relationship with this enfant terrible of the climbing world.One highly regarded figure who did get on reasonably well with Crowley was Oscar Eckenstein, ingenious rock technician who was to join Crowley on the 1902 K2 expedition. Two years before, Eckenstein and Crowley had formulated their plan to climb K2 whilst attempted to climb two 17.000 ft peaks in Mexico; Popocatepetl and Ixtaccihautl. After reaching 14.000 ft on Ixtaccihautl - which is Aztec for sleeping woman - they bizarrely then attempted to climb an active volcano- Colima-where,not surprisingly they were beaten back by the smouldering heat. However,during the same period they did manage to ascend Popocatepetl and a neighbouring unnamed peak of Colima. In March 1902, Crowley and Eckenstein met up in Delhi to begin their assault on K2. They had put together a strong team which apart from themselves consisted of Guy Knowles,Jacot Guillarmod a 33 year old Swiss Army doctor and two 31 year old Austrian guides,H Pfannl and V Wesseley. In late March the party left Delhi by train on route to the largely unexplored mountainous region of northern India. They alighted at Rawalpindi in the Punjab province with three tons of food and equipment and had quickly engaged a large team of porters who would carry their gear through the increasingly mountainous terrain. It was at this stage, as the party set of from Rawelpindi for Srinagar, capital of Kashmir that another extraordinary incident took place. Eckenstein,as leader of the expedition, was arrested by the local police inspector on the orders of the Viceroy of India himself.The Viceroy had given instructions that on no account was the expedition to K2 to continue. Unsurprisingly,Crowley, who was never a man to Kowtow to figures of authority, assumed leadership of the expedition and pressed on for Srinagar. The party's last link with civilisation was the village of Askhole where Eckenstein and Crowley disputed the proposed weight of the packs. To Eckensteins dismay,Crowley insisted on taking a large collection of poetry books with him. Needless to say,Crowley's wishes prevailed, later remarking." I could not have stood on the Baltoro Glacier in the absence of Milton'! By now the party had swelled to 230 men and a large travelling herd of sheep and goats with a few dozen chickens packed for good measure. By the 8th of June an advance party of 20 porters led by Crowley reached the Baltoro Glacier.After reaching 15.500ft on the Glacier, a clearing in the weather allowed the party their first uninterrupted view of of K2. 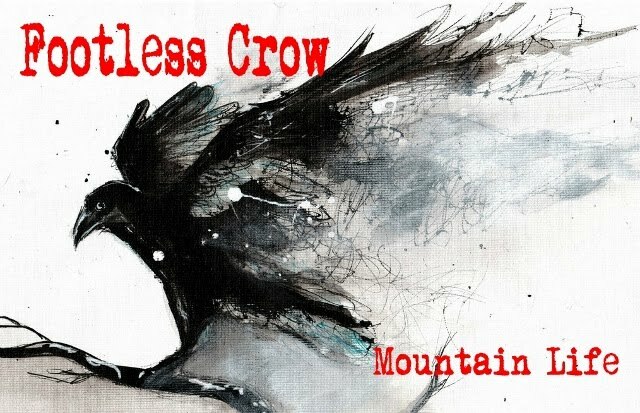 Despite his romanticism,Crowley observed the mountain with a practical eye. Using a telescope to ascertain the most promising line to the summit. He concluded that their best hope of success was by the South East ridge; a line taken by the 1938/39 United States expeditions. If Crowley was practical and matter of fact in his appraisal of the mountain and its potential difficulties,the staid and down to earth doctor,Jacot Guillarmod, was dumbstruck.He recorded in his diary his feelings on being confronted for the first time by the terrible vision of K2. "At first the fascination that it exercised on our minds was so great that, in spite of being accustomed to appreciate peaks at a glance.we were overwhelmed and paralysed. We stared dumbly , not being able to find a word to express the impression it made on us." Undaunted they set up camp 9 at 17000ft beneath massive overhanging ice walls from where Crowley based his attempt on the mountain; eventually establishing camp 10 at just under 19000'. From camp 10 Pfannl and Guillarmod launched their attempt to establish camp 11 but were beaten back by a sudden deterioration in the weather.At the same time Eckenstein and Knowles succumbed to a virulent bout of influenza and Crowley suffered the torments of snow blindness. For a time it seemed as if the weather and illness had beaten them before their assault had begun. However,a favourable change in the weather and an improvement in health and spirits enabled the party to set their sights on the north east ridge although this was against Crowley's advice. Nonetheless, Eckenstein as party leader sanctioned the change of plan and after a reconnaissance by Pfannl and Wesseley had confirmed the north east ridge to be 'definitely climbable' A new camp was established at 20.000ft. On the 10th July, Guillarmod and Wesseley reached 22.000ft on the mountain.It was to prove the highest point reached and concluded their audacious attempt on 'Chogo Ri '. 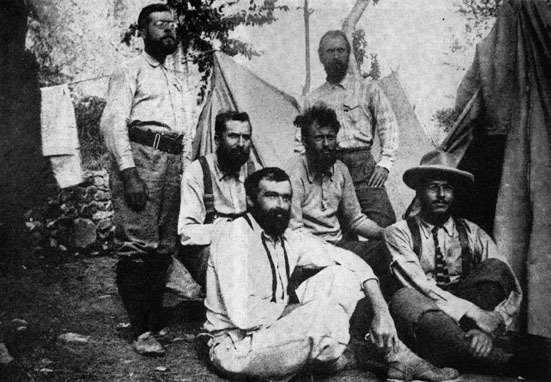 Crowley had now developed malaria; Pfannl was showing signs of altitude sickness and the weather had broken. 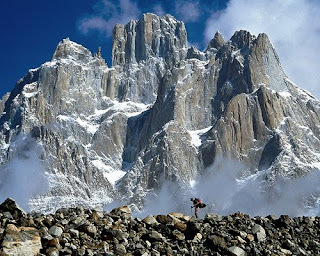 Nevertheless, they had reached a point which was 200ft higher than that reached by the Duke of Abruzzi seven years later, and often erroneously regarded as the first attempt on K2. Furthermore, they had survived for longer at high altitude than any other human beings. In all, something of a glorious failure. If K2 was a glorious failure, Crowley attempt on Kanchenjunga three years later.was to prove an unmitigated disaster. He had been persuaded to join a team attempting the first ascent of Kanchenjunga by his K2 colleague the Swiss doctor, Jacot Guillarmod. Crowley insisted that the expedition would be led by himself. A condition agreed to by Guillarmod but fiercely opposed by Eckenstein and Knowles who both pulled out of the team. Although Eckenstein was one of the few people to get on with Crowley, he had serious reservations regarding his unstable temperament..With the stabilizing force of Eckenstein removed from the equation Crowley felt free to draw up a contract which he insisted his colleagues sign,conferring full and absolute control to himself. Crowley's Kangchenjunga team consisted of Guillarmod,two Swiss army officers- Alexis Pache and Charles Reymond-who were both experienced Alpinists and an Italian- Alcesti De Rigo de Righi who had no mountaineering experience but was recruited for his organizational skills. The expedition finally got under way on the 8th August when the climbing team with their entourage of 230 porters and 3 personal servants left Darjeeling with 7 tons of equipment and provisions. By the 22nd they had reached the Yalung Glacier where clear skies and the relatively trouble free walk in had Crowley in wildly optimistic mood. In his diary he noted " Already at a height of 15000ft, I was in excellent physical condition.Not an ounce of my reserves had been used up. A completely clear path led to the summit in front of me. The mountain was hardly five miles away, the weather was improving and of the extreme temperatures which had been so terrible on Chogo Ri (K2) there was no trace. In short there was not a single dark spot on the horizon." 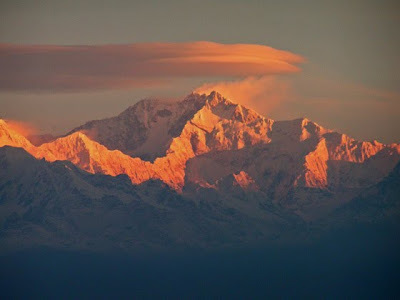 Contrast Crowley's diary notes with Guillarmod whose first views of the mountain prompted him to write ; " The western ridge of Kanchenjunga stood out against a cloudless sky of intense blue. Precipices swept incessantly by avalanches left us no hope of the possibility of direct access.' With two such sharply contrasting impressions from the two main players in the Kanchenjunga drama, it was little wonder that the protagonists saw a marked deterioration in their relationship from here on in. It was at this stage that most of the porters drew to a halt refusing to go any further" as for them, Kanchenjunga was a sacred mountain. To compound their distress, many of them did not have footwear and were forced to trek up the glacier in bare feet.Guillarmod was outraged by this failure on Crowley"s part to provide his porters with adequate footwear and he fully supported their refusal to continue. The further up the Yalung Glacier they travelled the more futile Guillarmod felt the expedition to be.On the 27th August one of the porters fell to his death and more porters deserted in the night. By the 29th Crowley had fallen out with every one and had resorted to using threats and physical intimidation to force the porters to continue. Guillarmod, disgusted at Crowley's violent conduct towards the porters decided that the time had come to depose Crowley as party leader. On September 1st, Guillarmod had been elected party leader by the remaining team members. 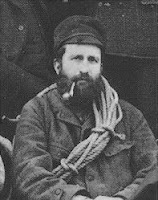 Crowley not surprisingly refused to give up the leadership and effectively placed himself beyond the pale as far as the rest of the team were concerned.Although the expedition had degenerated into a tragic farce,they had managed to force their way on and established camp five at 21.000ft. However, Guillarmod's hopes of salvaging some semblance of order from the jaws of disaster were to prove ill founded.That night Guillarmod with Pache and De Righi set off for camp four with four porters sharing a single rope. Crowley remained at camp five with Reymond.As they descended one of the porters slipped dragging Pache with him.Guillarmod and De Righi attempted to hold them but were themselves torn from their belays.Soon the entire party were plunging down the mountain.triggering an avalanche in the process. When their fall was finally arrested, Guillarmod found himself suspended in a large crevasse.De Righi was just above him,apparently unconscious. Guillarmod struggled out and managed to revive De Righi.Together they set about searching for the rest of the party now buried under the avalanche.Their shouts and screams had alerted Reymond who joined them from camp five in an obviously futile attempt to locate Pache and the three porters. Crowley remained at camp five throughout the proceedings,later claiming that he was unaware of the incident. An ill judged report in 'the Daily Mail' expressed disgust at the indiscipline of the party and hoped for " success in another year with a properly equipped and disciplined expedition.' Although Crowley was not directly involved in the tragedy the Alpine Club was quick to disassociate itself from Crowley and his Kanchenjunga expedition pointing out that Crowley had never been accepted as a member of the AC. The final sordid page in the ill conceived Kangehenjungan drama was an action which saw Guillarmod threatening to take Crowley to court for embezzling expedition funds. Guillarmod was finally dissuaded from this course by the expense of such action. Thus,Crowley"s great Kanchenjunga adventure had founded on the rocks of his unbridled romanticism and his absolute contempt for those 'hypocrites and pious materialists' who did not share his free spirit. Forty years later, a dying Crowley described his heroin induced fears and hallucinations as 'Kanchenjunga phobia.......It seems the spirits of the sacred mountain had followed him to the grave. Coming up: Aleister Crowley...madman across the water. This Friday, John Appleby describes Aleister Crowley's dramatic but ultimately doomed attempts to establish the first ascents of Kanchenjunga and K2 at the turn of the 20th century. Originally due to be published in the UK's 'Climber' magazine in the mid 1990's, the article never appeared in print format. The trail took us from Bithell's scrapyard to the banks of a rust-coloured brook choked with Datsun Cherries. Here to escape the drizzle, we sheltered in the back of a gutted Ford Transit while Ralph, our guide, rummaged in the saddlebag of Eric's Raleigh Tourer bicycle. We spread out an old edition of the Daily Mirror as a make­shift picnic cloth and set upon it a magnificent feast. There were home-made suet puddings, leftovers from last night's ocean pie, a thick-sliced Rathbone's white loaf, and a lukewarm quart bottle of Entwhistle's pale ale. "I don't think it's worth compromising where pale ale is concerned, do you?" Ralph said, eliciting a crescendo of approving murmurs from his trekking group. For the past five summers, Ralph Higginbottom, former painter and decorator, and Sandra Stunna, his common-law wife and former dance artiste, have been leading treks around upland Lanca­shire. "It's reet grand," Sandra said as she swallowed a Wall's pork pie and turned her gaze wistfully towards the cluster of TV transmitters on the summit of Winter Hill, now almost obscured by chimney smoke from the nearby nasal snuff factory. The pungent aroma of wet nettles and Sandra's underarm deodorant gagged in our throats as we marvelled at the yellow sunlight that now filtered through the smog and painted the valley floor in jaundiced brush strokes. Or was it emotion that caught our breath? So much had hap­pened since we'd first taken up our bulging Tesco carrier bags in Ralph and Sandra's back yard, our legs trembling with anticipation of adven­tures to come. Our journey of discovery had begun that morning as we toiled up the cobbled alley­ways of Bolton accompanied by a colourful throng of street urchins. Empty Coca-Cola cans rained down on us like confetti as they honoured us with a typically exuberant Lancashire send-off. Though pitifully undernourished from their diet of muesli and Sainsbury's washed green salad, these affectionate Boltonian children pedalled their Muddy Fox mountain bikes with astonishing speed and skill as they repeatedly buzzed past Eric on his ponderous Raleigh. But before long they grew weary from cheering and pelting us with half-bricks and returned home to watch videos and play their Nintendo game machines. Fred Dibnah demonstrates his answer to 'The Whillans Whammer'. 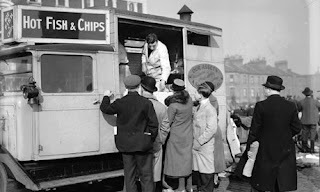 At the crest of Naggingbowel Rise we paused to sate our thirst, squirting Tizer into our mouths from the neck of the knotted pig's bladder strapped to the crossbar of the uncomplaining Raleigh. In the distance,barely recognizable through the industrial haze, glinted the glass canopy of Bolton North railway station where we had disembarked only the day before. Now the stations and its busy platforms lay far behind us as we trekked west towards the uninhabited uplands. Only when you leave behind the claustrophobic bustle of the towns and begin to penetrate the scrubby hinterland do you begin to appreciate the enormity of the barren wilderness that is Lancashire. And still we toiled, the crane flies rising from our feet like a plague of locusts, the interminable drizzle stroking our foreheads like the spittle from the toothless jowls of a Rochdale call-girl. And then, unexpect­edly, we came to the crum­bling brink of an escarpment from where we peered down on to the tormented boulders that littered the floor of Wilton Quarry. Had we arrived in the evening we might have spied the elusive Bolton Raiders shooting rabbits and anything else that moved with their rudimentary shotguns, or groups of leather-jacketed bikers mating in the bushes, but now, in the full heat of midday, the quarry was silent but for the echoing cries of flimsily clad climbers as they tumbled from the slippery rocks. Eric, our noble bicyclist, worked in the quarry during the winter to supplement his meagre income as a trekking porter, stripping copper and other semi-precious metals from abandoned household appliances. He grinned humbly as we complimented him on his handiwork each time we passed the empty husk of a Hotpoint fridge-freezer. By late afternoon, having consumed the suet pudding and pale ale, we stumbled across stunted heather towards a smaller rock-walled depression on the far side of the moor. This, we learned from our knowledgeable guide, was the famous Brownstones Quarry, historic scene of many bitter and bloody struggles. It was here, way back in 1949, that Eric Parr, Prince of Brownstones, subjugated the ferocious 20ft fissure of Parr's Crack, and where Hank Pasquill, Duke of Wilton, later reigned unchal­lenged for almost a decade by his ruthless application of tight-fitting EBs. Viewed at dusk these sombre ramparts can still evoke their turbulent history. In the green dell beyond the quarry we reached our lodgings for the night. Eric had pedalled on ahead, and by the time we staggered into the clearing, tangy woodsmoke was already curling into the still evening air from among the circle of abandoned gypsy caravans. There was bread and dripping for supper, and a gallon of silk-textured stout to round our bellies. As we sat in a circle around the campfire, doubled up with abdominal pains, Eric played the harmonica while Sandra entertained us with her exotic dances. During the poignant interludes while she recovered her tassles, we listened in awe to the sounds of the wilder­ness. Beyond the fireglow, in the shadowy gloom at the perimeter of the clearing, we could hear the rustling of rodents as they scavenged among the sacks of household refuse, while from nearer at hand came the staccato bursts of flatulence as our alimentary expulsions ripped through the night air. Next morning we packed our carrier bags early and descended into the chaotic village of Horwich for an authentic Lancashire breakfast of fried eggs, fried bread, fried bacon, fried sausage and fried tomato, twice, causing a grease blockage of the gullet so severe that only a pint of piping hot tea would shift it. It was in Horwich that we exchanged Eric's faithful but now impractical Raleigh for the Sierra taxi that would take us and our baggage down the winding mountain roads to Lower Ince and the end of our journey. Darren, our driver, seemed oblivious to traffic signs and road markings as he steered his bucking vehicle one-handed down the pitted and crumbling highway, scattering villagers and dustbins with undifferentiating abandon. Lower Ince encapsulated all the vibrant romanticism I expected of South Lancashire, and it was wonderful to relax among the clutter of foam trays and chip forks in the bus shelter as we waited for the number 59 back to Bolton. Yet somehow I remained an outsider in this tourist town, a foreigner among the broad-hipped local women who, with bent backs, shuffled along the pavements under their enormous loads of disposable nappies, and yet equally distanced from the camera-clicking visitors who bartered for trinkets along the row of factory reject shops. I was here yet not here, for my heart was still in the barren uplands, where the crows had wheeled in patient circles above Ralph's ageing pet whippet and the rain fell upon us in a cleansing shower of dilute sulphuric acid. Where the only sounds were of the ceaseless marital bickering between Ralph and Sandra, and of Eric's convulsing lungs as he fetched up another gobful of tar. And where we promised ourselves that one day, whatever the sacrifice, we would return. from Lower Ince, start at £287 per person. carrier bags (bring your own or buy them from Ralph at 7p each), there is no backpacking involved; all heavy luggage is carried on Eric's trusty Raleigh bicycle. Anyone who is reasonably fit and capable of digesting large quantities of lard should be able to enjoy this holiday. Accommodation comprises one night bivouack­ing on the wash-house floor of Ralph and Sandra's house at 47 Lumbago Avenue, Bolton, and one night in a derelict caravan somewhere near Horwich. All food is provided, though the operators regret that they are unable to cater for vegetarians. Prospective trekkers are advised to take out health insurance and to bring with them a supply of Rennies. 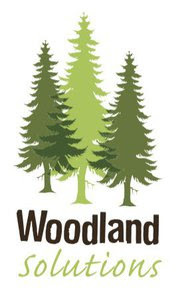 (Steve Ashton travelled to Lancashire as a guest of High Falutin Holidays). first published in High: July 92. Coming up: Steve Ashton finds it's grim oop north ! 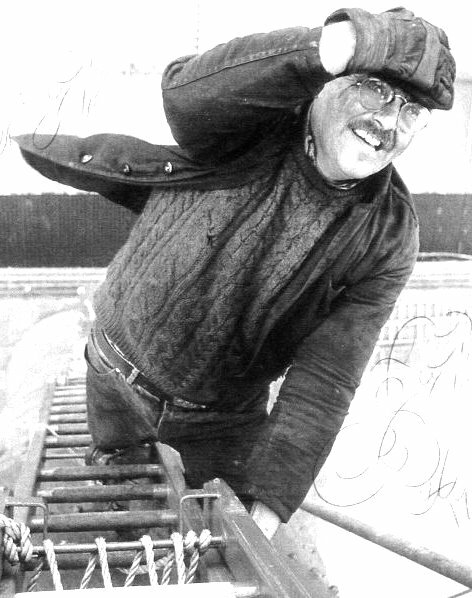 Legendary Bolton climber Fred Dibnah fights to retain his flat cap on the first ascent of the north face of Bacup Brick works. In the green dell beyond the quarry we reached our lodgings for the night. Eric had pedalled on ahead, and by the time we staggered into the clearing, tangy woodsmoke was already curling into the still evening air from among the circle of abandoned gipsy caravans. This Friday: Another classic slice of Ashton. 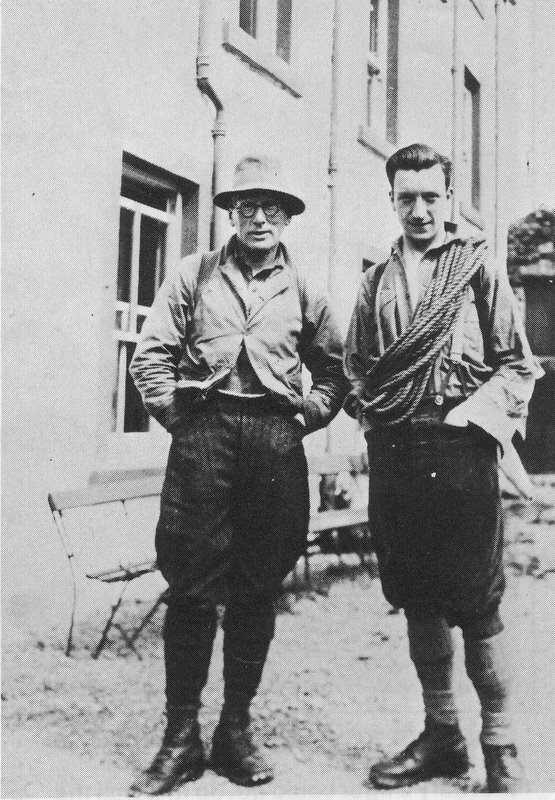 George Basterfield(L)and Harry Griffin outside the Wastwater Hotel. 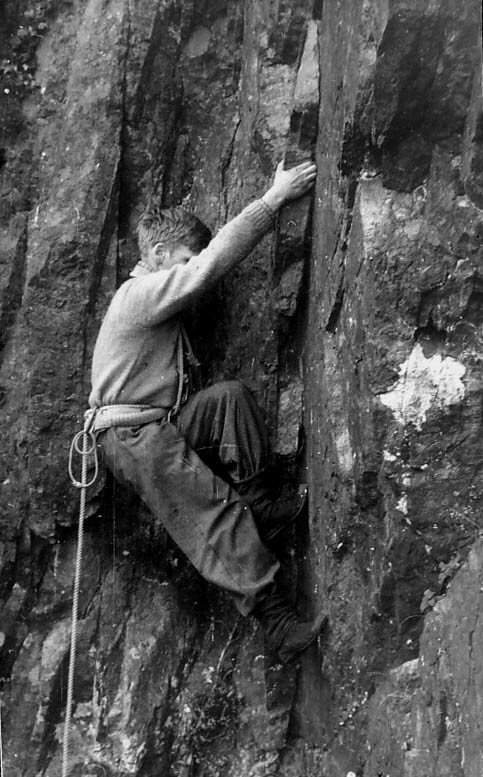 Climbing in the Lake District 50 years ago was not strikingly dif­ferent from the earliest days of the sport towards the end of the 19th century. Several of the original pioneers, including Haskett Smith, Godfrey Solly and George Abraham, were still alive and often, quite active; clothes, equipment and techniques had not changed a great deal, and the number of climbers and clubs can hardly have been one tenth of today's total. Standards, of course had risen considerably since the first assaults on the gullies and chimneys but there were fewer than 300 climbers in the whole area. Today,the total is between two and three thousand. 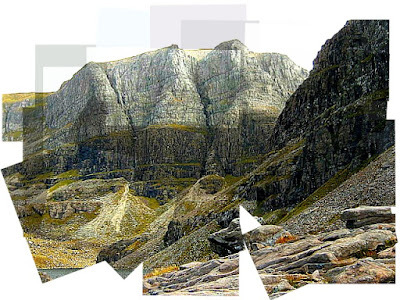 The hardest climb, by far, in Lakeland in the late 1920s was Central Buttress — described in the guide as "among the worlds hardest". Since its first ascent in 1914- perhaps the biggest breakthrough ever in British climbing; the climb had only twice been repeated. One of the hardest climbs in Langdale was, strangely, E Route on Gimmer and fewer than twenty climbs were listed in Borrowdale.A section tacked on to the end the Great Gable guide. 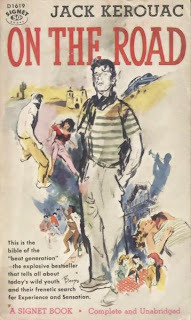 "The climbs in Borrowdale," stated the introduction to this guide, "are few and far between". Today, there are at least 400 of them. Fifty years ago there were no climbing huts or youth hostels in the Lake District, no telephone at Wasdale Head and no cars on the roadside below Shepherd's Crag. This latter climbing gymnasium — apart from an isolated ascent of Brown Slabs by Bentley Beetham and Claude Frankland — had not been "discovered". There were no massed conifers in Ennerdale, Mardale had not been flooded and Millican Dal­ton, Professor of Adventure, was living in his cave in Borrowdale. Few people in England at that time had even heard of Adolph Hitler. Wonderful, spacious days on uncrowded crags, those climbing adventures in the late 1920s—care-free, youthful days, so long before the threat of war, when the Lake District, outside of holiday time, was still a quiet, secluded paradise with few cars, no caravan sites or litter baskets and the four-in-hands still I going over the passes. It so happens that one day this summer — the actual date escapes me — was the 50th anniversary of my first rock-climbing in Lakeland and the occasion was quietly celebrated in July by a repeat per­formance. Every detail of that wonderful day in 1928 comes back to me with startling clarity—the walk to the crag, almost every move on the climbs and even some of our conversation. My first "proper" climb was Woodhouse's Route on Dow Crag, followed by the descent of Easter Gully, the ascent of Arete, Chim­ney and Crack and the descent of Great Gully. 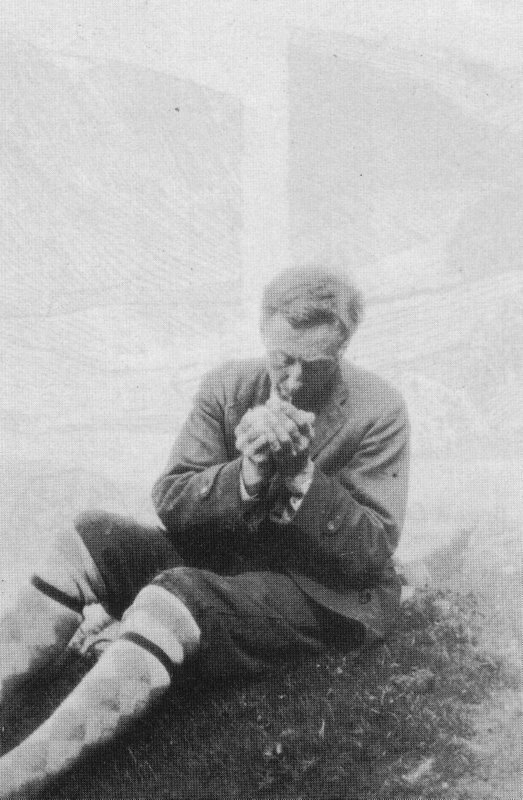 George Basterfield, one of the climbing pioneers at the time and, soon afterwards, President of the Fell and Rock Climbing Club, was my leader —and, for 21 years afterwards until his death in 1949, a close friend. He taught me how to climb — as he did scores of others— encouraged me to lead my first severes and very severes, showed me much of the hidden beauty of the Lake District, and introduced me to many of the leading climbers of the day. It came about this way. I wanted to get my boots nailed with clinkers but had no idea how to go about it. The only climber I knew—by name and reputation only—was George who happened, at the time, to be Mayor of Barrow in Furness. 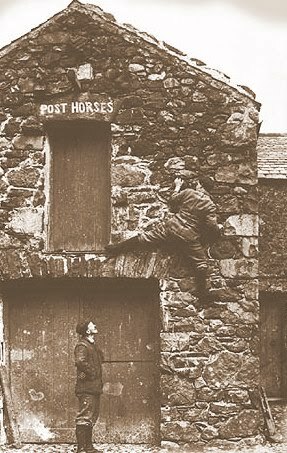 So I went along, a very raw youngster, to seek his advice in the Mayor's Parlour and he not only told me where to get my boots nailed — by George Stephens at Coniston- but offered to take me climb­ing the following Sunday if I cared to meet him on Dow Crag .A typical ges­ture from this kindliest of men. In fact, we met in the old Quarries near Tranearth above Torver and walked up to the crag together, George pointing out the routes as we approached. During the walk he looked down at the track and announced that so-and-so was on the crag that day — he could tell by the imprint of his nails. Some climbers used distinctive types of nailing — occa­sionally, with nails of their own man­ufacture — and George, of course, knew them all. To a youngster this smacked of magic! On our way up Woodhouse's George was hailed from the screes by A. T. Har­greaves and Billy Clegg and we descended Great Gully with them —they had been "looking at" Eliminate A. Clegg was to be the author of the 1938 Langdale guide — Basterfield had writ­ten the earlier edition — and Hargreaves was later to be involved in both the Scafell and Dow Crag guides. Har­greaves, one of the leading climbers of the day, sadly met his death on a skiing holiday at Obergurgl in 1952. Since that first climbing day in 1928 — I don't remember seeing any other peo­ple on the crag — I must have repeated Woodhouse's more often than any other climb—dozens of times, in all weathers, including snow and a descent in dark­ness. Dear, old familiar Woodhouse's B, with its often tantalising third pitch. I have known far better climbers than myself fail at this in bad weather and be forced to continue, instead, up the much harder final pitch of Abraham's Route. It is a source of some satisfaction to we old-timers that Woodhouse's has been upgraded since we first knew it — hard V. Diff. now compared with merely Dif­ficult in the clinkers and hemp rope days. Other routes now graded as harder than when we did them in the late 1920s and early 1930s include Eagle's Nest Direct, Kern Knotts Crack and Smuggler's Chimney — all translated from severe to very severe. Napes Needle, too, has gone from difficult to hard very difficult. There might have been 50 or 60 people regularly climbing on the Lake District crags 50 years ago — every weekend, I mean, not just in the holidays — and we knew nearly all of them. Little groups of climbers from the Kendal, Keswick, Pen­rith, Barrow and Ulverston areas met frequently on the crags, and at holiday times there was an influx from the uni­versities and elsewhere. The first of the major climbing huts in the district, the Robertson Lamb hut in Langdale, was opened by the Wayfarers' Club in 1930 — six years before the Fell and Rock's first hut, Brackenclose. The little private club to which I then belonged, the nine-strong Coniston Tigers, opened its hut, a converted, timber-built garage, in a field at Coniston Old Hall about the same time as the Robertson Lamb. Despite our high-sounding name nobody knew about us, except the regulars on Dow Crag and Gimmer. It was George Bower who, indirectly, gave us our name. Some of us had high hopes of a direct start to Murray's Route on Dow, but George said that only a tiger could get up it. It was the first time I had heard this use of the word "tiger" applied to climbers. I thought, for some time afterwards, that he had meant the animal itself. Anyway, we called ourselves, more in hope than in reality, the Coniston Tigers, and when three of us did the first ascent of the climb in 1931 we named it Tiger Traverse. 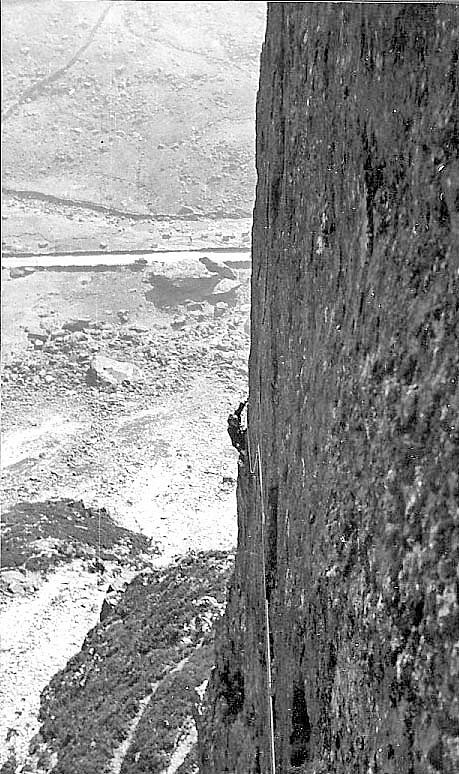 Our best climber, by far, was Jim Porter of the well-known Eskdale family, who could be quite at home lead­ing a route like Black Wall on Dow. Once, to christen a new rope, he made a solo ascent one evening from Eskdale, of Bot­terill's Slab. Unfortunately, a very seri­ous fall on Gimmer put an end to his climbing. Before we formed our little club I used to go to Dow on my own, hoping that somebody might take me up a climb. I had a 60 feet length of Beale rope — discarded by a senior climber after a falling stone had cut his rope in two. I remember that Mrs B. Eden-Smith, Harry Kelly's second in Moss Ghyll Grooves and many other fine climbs, was one of those who kindly took me in tow. Billy Clegg and the late Geoffrey Barker had a private hut somewhere on Wetherlam a year or two before we began our Coniston venture — almost certainly the first climbing hut of any kind in the Lake District — and there were a few family bases or weekend cot­tages scattered throughout the district. Climbers mostly stayed in hotels and the Wastwater Hotel at Wasdale, under John and Sally Whiting, was the centre of the Lake District climbing. Portraits of Will Ritson and Owen Glynne Jones, with dozens of other pictures of climbs and climbers, adorned the dining room walls, the hall was full of boots, ropes and ice-axes, a chest on the stairs could provide you with socks, shirt or trousers in emergency, and the billiards room had still not been converted to a modern lounge. 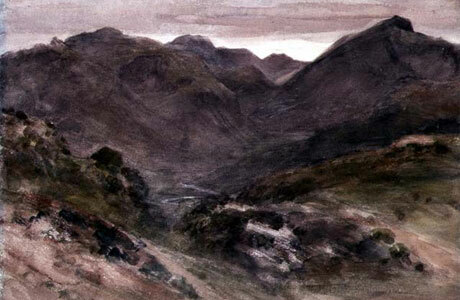 One of the regulars at the Wastwater was A. E. Field, a quiet, scholarly figure, who had taken part, with Jones and George Abraham, in the epic first ascent of Walker's Gully in 1899. He was pic­tured on the dining room wall, wearing old-fashioned tweeds and nailed boots, on the slightly sloping holds of Eagle's Nest Direct — looking poised and con­fident in an extremely exposed situation. This Abraham photograph had always fascinated and slightly terrified me and it was a delight to meet the man himself. Some time later I was encouraged to lead the climb by George Basterfield who, as second, made it all seem much easier than the photograph. 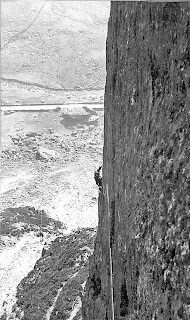 On one occasion I was fortunate enough to have a week's climbing at Wasdale with George Sansom who had been on the first ascent of Central But­tress with Siegfried Herford in 1914. 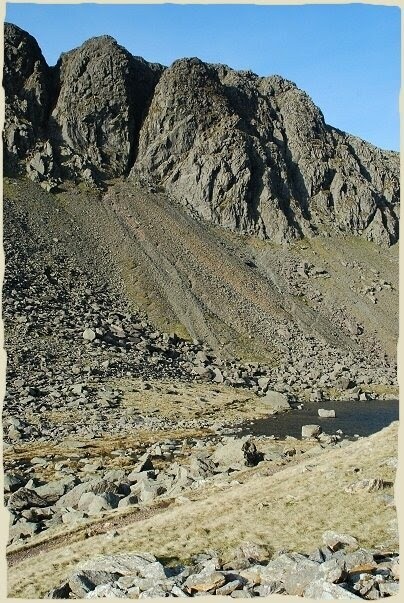 We did many of the Wasdale climbs and he also took me up the North West on Pillar — my first very severe. Sansom, still alive today in his eighties and still keenly interested in Lakeland and climbing developments, was the quickest and neatest climber I have known.He used to smoke a cherry-wood pipe and eat bar­ley sugar — useful for making fingers stick to small holds, he told me. At that time his favourite climb was Hop­kinson's Gully on Scafell Pinnacle, which he used to ascend regularly, on outings from the south, without doing a training climb first. Another of the Wasdale company in those days was C. F. Holland, author of the first Scafell guide and climbing com­panion of both Herford and Kelly. Hol­land was deeply affected by the death of Herford during the first World War and believed that sometimes he met his spirit in the fells — on one occasion, an almost personal encounter. The outstanding climbers in the Lake District 50 years ago were probably H. M. Kelly and G. S. Bower, although by then both were drawing towards the end of their greatest achievements. Kelly, pioneer on Pillar, Scafell and Great Gable, had written the first Pillar guide and Bower, especially active on Dow Crag and in Langdale, the Dow Crag guide. This latter was the first Lakeland climbing guide to be published — the first of the series of excellent, red-backed guides launched by the Fell and Rock. 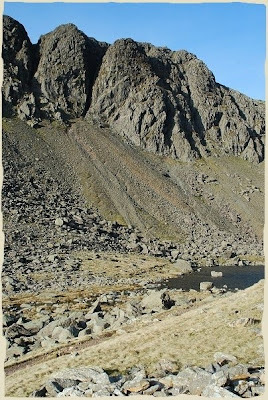 In those guides Dow Crag was written "Doe" and Scafell Crag, "Scawfell". Other prominent pioneers at that time were H. S. Gross, who worked out the Eliminates on Dow and wrote the first Great Gable guide, Basterfieid, G. G. Macphee, H. G. Knight and Fergus Graham. Just emerging as outstanding leaders were A. T. Hargreaves and Maurice Linnell, who together opened up the possibilities of Scafell's East But­tress. J. 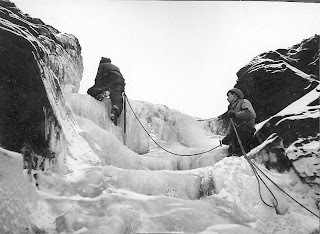 A. Musgrave, who made a point of leading all the new, hard climbs in nails, and F. G. Balcombe, whose routes included the splendid Engineer's Slabs on Gable Crag. It was to be another ten years before R. J. Birkett first began to come into his own as the outstanding leader in the district. A. B. Hargreaves, more active in North Wales at this time, was, however, with Linnell on the girdle traverse of Pillar and also on Esk But­tress. Colin Kirkus, on a rare visit from his beloved Wales, put up the bold lead of Mickledore Grooves in 1931. One remembers too, some of the very earliest pioneers met in the hills half a century ago — Haskett Smith, with his curious, long coat, his fierce moustache and his gift of ready repartee; Godfrey Solly, with his great, white beard and solemn speech, leader of the first ascent of Eagle's Nest on a cold day in 1892, and George Abraham, still erect and slim, with his stories of Owen Glynne Jones. One day, long before the war, I remember watching Geoffrey Winthrop Young climbing one of the Dow Crag buttresses, led, I think, by George Bower, with a third man helping him to raise his metal leg on to the holds. Glancing again at the old, red guides I am reminded that weekend terms at the Crown Hotel, Coniston were 21 shillings inclusive in those days—from dinner on the Saturday evening to breakfast on the Monday. Dinner, bed and breakfast was half a guinea. "Carter's celebrated climb­ing boots" were advertised at £4-12-6, including nailing. We used to use ordi­nary army boots, nailed by George Stephens. Years later I bought my first pair of Lawrie's boots and had to go to Burnley to get measured for them. On the harder climbs we wore cheap, black plimsolls — a size too small to give a tighter fit. The best were the cheapest, with very thin soles, costing one and sixpence. We used Beale's "Alpine Club" manilla hemp rope, with its thin red strand down the centre, which got very heavy and almost unmanageable when wet. Sometimes, on climbs with long run-outs or small belays, we used line — partly to avoid the pull of a heavier rope which we must have con­sidered more important than the safety of thickness. We had no slings or karabiners, no pegs, nuts or bits of wire. If a pitch was 80 or 100 feet long you ran out that length of rope without pro­tection. The shoulder belay was uni­versal and abseiling, without a sling, could be rather painful. If there was an accident you dealt with it yourselves as best you could, for there were no moun­tain rescue teams in those days. Some­times, after an accident on Dow Crag, Bill Fury, the Coniston fireman, would bring a horse and cart as far as the shoulder below Goats Water, to ease the carry down the fell. Developments in climbing equipment seemed to come very slowly. There were many experiments with nails — some, you screwed in — and the waisted clinker, reducing the effective width of the nail, was hailed as a great step for­ward. I still occasionally use an old pair of "iron boots", finding them excellent on wet, greasy rock and also on hard-packed snow or ice. 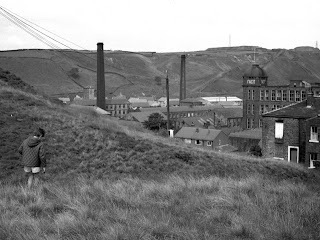 Fifty years ago George Basterfield was climbing with a pair of ordinary shepherd's boots, curled up at the front, and, many years later, I climbed with Jim Birkett when he was wearing quarrymen's boots with caul­kers, like horseshoes, all round the soles. Even so, his footwork put mine to shame. 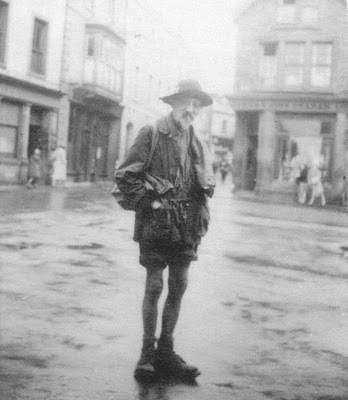 Robert Lawrie was a pioneer of boots made for climbers and Vibrams were then unknown until the flood of footgear from abroad came after the war. We climbed much more often on wet rock than climbers do today, nailed boots being more suitable for these conditions and often added a walk over the tops after our climbing. Anoraks and climbing jackets did not come into reg­ular use until after the war — mostly we used old tweed jackets, corduroy breeches and balaclavas, and just got wet through if it rained. Sometimes, if you were trying something really hard, you wore a white polo-neck sweater, because these showed up well on photographs! I remember Graham Macphee, not long after his epic traverse with F. S. Smythe, of the Aiguille Blanche de Peuterey in appalling weather, showing me, with pride, an anorak he had made himself out of an old mackintosh, with cunningly con­trived cords to adjust the length. There were no professional guides in the Lake District 50 years ago, apart from kindly old Millican Dalton, the Borrowdale hermit, who would take you up the Needle, make you a tent or rucksack, or cook you a meal in his cave. J. E. B. Wright began his guiding, amid some opposition, in 1930 and Jim Cameron started in 1937. And there were no out­door pursuits centres, either — you worked your way through the lists with a friend, learning the hard way. But today, the holds seem to have shrunk and moved farther apart, and the climbing scene, with very severes the norm and extremes beyond belief, is a world removed from our care-free adventuring fifty years ago.
" On our way up Woodhouse's George was hailed from the screes by A. T. Har­greaves and Billy Clegg and we descended Great Gully with them —they had been "looking at" Eliminate A. Clegg was to be the author of the 1938 Langdale guide — Basterfield had writ­ten the earlier edition — and Hargreaves was later to be involved in both the Scafell and Dow Crag guides. Har­greaves, one of the leading climbers of the day, sadly met his death on a skiing holiday at Obergurgl in 1952. Since that first climbing day in 1928 — I don't remember seeing any other peo­ple on the crag — I must have repeated Woodhouse's more often than any other climb—dozens of times, in all weathers, including snow and a descent in dark­ness. Dear, old familiar Woodhouse's B, with its often tantalising third pitch. I have known far better climbers than myself fail at this in bad weather and be forced to continue, instead, up the much harder final pitch of Abraham's Route. It is a source of some satisfaction to we old-timers that Woodhouse's has been upgraded since we first knew it — hard V. Diff. now compared with merely Dif­ficult in the clinkers and hemp rope days. Other routes now graded as harder than when we did them in the late 1920s and early 1930s include Eagle's Nest Direct, Kern Knotts Crack and Smuggler's Chimney — all translated from severe to very severe. Napes Needle, too, has gone from difficult to hard very difficult'. This Friday: An article first published 35 years ago by legendary Cumbrian writer and mountain activist, the late Harry Griffin who recalls half a century of Lakeland climbing. The Good lads always have two...part two. The ever resourceful Ray Greenall was also responsible for the Rock and Ice ceremonials. It was Ray who made and awarded the famous 'Brewmaster Certificate'. This certificate was awarded to outstanding tea makers and was traditionally written on the back of a Woodbine cigarette packet. He also made the Iron Cross, the highest Rock and Ice award for valor, awarded for taking a long leader fall without screaming. I won this award outright one cold, February day with a ninety-foot fall when my numb fingers uncurled from the very top of Cenotaph Comer This fall left me slightly bruised around the waist, as we did not have harnesses then, but otherwise unharmed. arrived and said: 'Oh. by the way. Ray. we got our tent poles mixed up last week .Shortly afterwards. Ray was to be seen putting his engineering skills to further use in cutting and fixing short lengths of tree branch to Charlie's poles. Much of our gear was modified or home-made and Ray and Pete Greenall did not endear themselves to their mother when she discovered the sleeves missing from her fur coat: they had been taken to make much needed hats and gloves. It is not possible to introduce all the early members of the Rock and Ice in an article of this length; legendary characters such as Harry Smith and Nat Allen merit articles in their own right. However, no account of the Rock and Ice would be complete without a mention of Morty. One day my mother said that a neighbour's son was interested in rock-climbing and would I take him out. I correctly interpreted my mother's request as a com­mand and the lad was duly taken out. Joe Brown asked him what his name was and he said "Joe Smith." To which Joe replied: " We can't have two Joes in the club: you're Mortimer.' And the name stuck. An amusing incident occurred very late one night when Joe and Morty were returning from a winter weekend armed with ice axes and looking decidedly disreputable. As they walked through central Manchester they were stopped and questioned by a policeman. "What's your name? " he asked Joe. "Joe Brown." came the reply. 'Joe Smith.' replied Morty. The policeman looked at them thoughtfully for a moment and then said: "It doesn't matter to me if you don't tell me your right names you know." Morty had the difficult task of holding his own in a group of very competent climbers who did not see themselves in the role of nursemaid. Like many teenagers he was incredibly clumsy and while he learned the "ropes' we also learned to avoid disasters by keeping boiling billies of water and other potential sources of mayhem well of his range. Fortunately he had a great sense of humour — which was virtually a prerequisite of Rock and Ice membership — and he was very strong and a quick learner. His confidence and resourcefulness became evident when he hitched to Chamonix with £16 in his pocket for a fortnight holiday. While there he purchased the obligatory pair of Terray boots (£7) and returned home with £2 in his pocket. Soon he was leading the fierce gritstone classics and ap­peared all set to be a top class leader but an unfortunate accident put paid to his aspirations. While trying out a friend's motor cycle and side car com­bination, (tricky to drive if you are not used to them), he lost control of it outside Plas y Brenin and fractured his femur on one of the iron posts which used to surround the garages. This accident effectively marked the end of a very promising rock-climbing career. Winter for the Rock and Ice meant business as usual; rock-climbing interspersed with long walks and some snow and ice work. Skiing was totally frowned upon as a sport for sissies. Basically, we could not afford even the simple ski gear of the day and I am sure that this coloured our view of the sport to a great extent. Though to be fair we were totally obsessed by rock-climbing. Winter was, In fact, the ideal time to practise aid climbing with an eye to the big alpine routes. Until we started to attempt aid routes on Derbyshire and Yorkshire limestone, nobody had attempted any serious aid climbing in Britain or faced the challenge of the overhanging limestone crags. To attempt an aid climb we had to pool all our gear to enable the leader to tackle a long pitch and the subsequent sort-out at the end of the weekend was when the day was really won or lost. This gear sort-out led to everyone purchasing name stamps with which to stamp karabiners and other valuables. The simple idea of coloured insulation tape did not occur to us at the time. 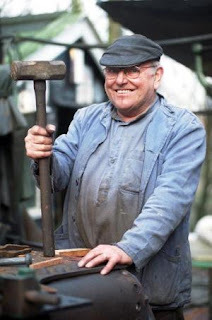 Much of our gear was home made: Ray made his lovely, alloy pegs at work Joe had a batch of wrought iron pegs made by a black­smith; I made wooden wedges and etrier rungs from oak and we also impro­vised with various lumps of metal of suitable shape to be hammered into cracks. At first we did not use etriers and clipped a sling to each peg but quickly discovered the disadvantages of this system. Winter was also the social season. The nights were longer and climb­ing was not pursued quite so rigorously although we did have sudden in­spirations which could easily lead to demanding situations. One such occa­sion occurred one winter evening, just about dusk. We were ensconced in our winter quarters, 'The Grand Hotel', which some of you will know as the cave formed by a huge rectangular boulder below Stanage Wall End area, when it was suggested that we go out and climb Goliath's Groove alpine style. A party of about five or six of us assembled at the foot, Joe leading in nails. I think Ron Moseley, Doug Belshaw, Eric Price, myself and maybe Don Whillans made up the remainder of the team. We roped up a few feet apart and set off each carrying a few coils. When we were well strung out up the crack there came an ominous scraping and a shower of sparks from the crucial overhanging section where Joe, barely visible in the gloom, was hav­ing a little trouble staying in contact with the rock. I had visions of the headlines `Climbers Die in Alpine Tragedy on Stanage Edge, but fortunately Joe was equal to the task and we all arrived safely on the top to feel our way down in the dark. On another occasion, staying this time in the Roaches barn, some­one suggested that we go and bivvy under the Sloth (all these epics seemed to be centred around misguided practice for the Alps). Eventually, Ron Moseley, Pete Greenall and I left the comforts of the barn and climbed the first pitch of Pedestal Route to the ledge beneath the Sloth. Pete and I opted for sitting on the broader part of the ledge and Ronnie lay down on the narrow part with the rope tied around the outside of his sleeping bag. It was certainly a good introduction to how long and cold a bivouac can be and the winter's night passed very slowly indeed only briefly enlivened when Ronnie fell off the ledge with about four feet of slack in his belay and had to be hauled back aboard as, with his hands tucked inside his sleeping bag, he was unable to help himself. At first light we lost no time in finishing the route and heading back to the home comforts of the barn. One of the great unsung heroes of the club was Nat Allen. He was full of fun and always willing to pass on his vast experience of climbing to oth­ers. We always looked forward to hearing his cheerful "Eh up youth, how's it going?" as he arrived at the weekend venue. Nat, being a member of Derby Mercury cycling club provided our entry into the social event of the year. the Derby Mercury Bonfire and Pantomime held on the nearest Satur­day to bonfire night at Ilam Youth Hostel. This riotous affair was followed, on the Sunday moniing, by the Dovedale Dash. a cross country run of about five miles. The competitors would line up outside Ilam Hall, many with a sausage 'buoy' in one hand and a cigarette in the other. There was some rivalry between the fitter participants but basically it was a fun event intended to shake off the cobwebs from the revelries of the previous evening. Inevitably, and unfortunately, fit-looking chaps with smart running vests soon started to appear on the scene and when the first six places began to be filled by international cross country runners the event started to lose interest for climbers. As we became more affluent we began to acquire motorcycles and eventually old vans and cars. There are probably more stories about the motorcycling epics of the Rock and Ice and of the Cromlech Club- with whom we have always had a very close relationship- than there are of our rock-climbing exploits. Fortunately the roads were considerably quieter back in the 50s and few of our accidents were serious. No longer reliant on public transport, weekend visits to Wales and the Lakes became possible. Conse­quently the motorbike era heralded a flurry of new routes further afield. The Alps were also much more accessible and for our early alpine ventures we had to equip ourselves with state of the art survival gear: ladies' plastic macs (only ladies' macs had hoods). Ray Greenall relates the story of travel­ling out to the Alps with Fred (Count Fred Neddygough) Gough, The first proud Rock and Ice owner of a car. Fred would drive all day and on arrival at a camp site would consider his day's work to be done, pick up a book and read while Ray made camp and started the meal. After a day or two of this routine Ray decided that a change was due. As Fred picked up his book Ray handed him the water bucket and told him to get some water. Fred looked up stricken, total surprise and horror written across his face, and said plaintively: "What, me? I don't speak the bloody lingo!" Trips to the Alps were always a great adventure: Eric Price, on his first trip to the Alps, found himself with Joe, Nat and Don, climbing as two ropes in a party of four attempting the first British ascent of the North Face of the Grand Charmoz. Eric, a strong and gifted climber but with a preference for seconding, is normally quiet and reserved. On this occasion, very much overawed by the situation, he was staying very quiet indeed and said virtually nothing throughout the first day and the subsequent bivouac high on the face. On the second day conditions quickly started to deteriorate but the team pressed doggedly on. Don was leading across steep neve when Eric, uttering his first words of any note in two days, shouted across: "Hey, are you keen on this?' at which both teams turned and retreated to the valley. Nothing is to be gained from listing the achievements of the Rock and Ice in Britain or abroad: many are already well-known and virtually all are to be found in the new routes sections of the guidebooks. In this article I have endeavoured to convey the fun and joy of being a young rock-climber in the 50s when rock-climbing as we now know it was just in its infancy. J.M.Edwards, a climber way ahead of his time, had already pointed the way with his audacious routes on The Three Cliffs. Peter Harding, ably asissted by Tony Moulam, pushed the standard in the 40s and re-introduced the grade Extremely Severe for the first time since the Abraham brothers graded rock-climbs, Easy. Moderate and Extremely Severe (a system which holds a great deal of merit). With these examples of what was possible, the Rock and Ice arrived on the scene, spearheaded by Joe and Don and with the collective ability to take climbing into a new era. ......The rest is history. First published in the Climbers Club Journal. My thanks to Don for permission to re-publish this article and for the original photographs and to the CC for their cooperation.